The Organic Meal Replacement Shake You’ll Love nutrition you're looking for, with a delicious taste and creamy texture you'll love. 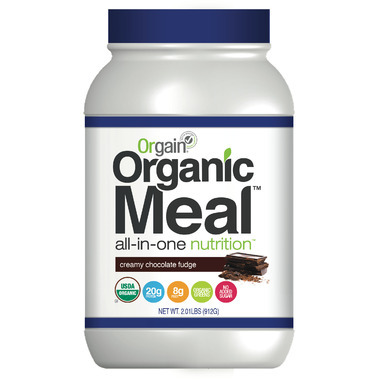 In addition to 20g of organic, plant-based protein, each serving of Orgain Meal Powder provides 8g of organic fiber, organic fruit & veggies, and organic sprouts and greens. It's the perfect solution for anyone who is serious about complete, organic nutrition (or anyone looking for a healthy on-the-go meal replacement)! Orgain Organic Protein Blend™ (Organic Brown Rice Protein, Organic Chia Seed, Organic Pea Protein), Organic Creamer Base™ (Organic Acacia Gum, Organic High Oleic Sunflower Oil, Organic Inulin, Organic Rice Dextrins, Organic Rice Bran Extract, Organic Rosemary Extract), Organic Rice Dextrins, Organic Erythritol, Organic Natural Flavors, Organic Sprout Blend™ (Organic Sprouted Amaranth, Organic Sprouted Quinoa, Organic Sprouted Millet, Organic Sprouted Buckwheat, Organic Sprouted Garbanzo Bean, Organic Sprouted Flax Seed, Organic Sprouted Sunflower Seed, Organic Sprouted Pumpkin Seed, Organic Sprouted Chia, Organic Sprouted Sesame, Organic Sprouted Lentil, Organic Sprouted Adzuki), Organic Greens Blend™ (Organic Barley Grass, Organic Wheat Grass, Organic Oat Grass, Organic Alfalfa Grass), Organic Stevia, Natural Flavors, Organic Guar Gum, Xanthan Gum, Organic Acacia Gum, Organic Spinach, Organic Kale, Organic Beets, Organic Tomatoes, Organic Carrots, Organic Raspberry, Organic Blueberry, Organic Acai, Organic Banana, Organic Apple, Organic Amla Fruit (Vitamin C), Organic Food Based B Vitamin Blend™ (Organic Guava, Organic Lemon Extract, Organic Holy Basil).